The International Metrorail 2008 Conference named the Copenhagen Metro as the world’s best metro system. The award noted the system’s high stability, passenger satisfaction and security. The Copenhagan Metro took light rail and metro technology to a new level when it opened in October of 2002. It added a new extension in 2007 that runs between the airport and the city center in a trip that takes just 15 minutes. It is also a model of inclusive design from stations and rolling stock to its customer-friendly high technology systems. You can send a text message to purchase your Metro ticket and ride fully automatic, driverless Metro trains. Seamless options for vertical transport within stations and welcoming, comfortable cars are reliable throughout the new system. Copenhagen plans additional extensions through 2018 for a total system construction cost of $4.5 billion. In the early 1990s former mayor of Copenhagen, Jens Kramer Mikkelsen, sought to create a new neighborhood in Copenhagen called Oerestad, located on the island of Amager. Success depended upon a modern public transportation system, well beyond the design and functionality of the old heavy rail commuter network. It partially replaces it. Though inevitably a high cost infrastructure investment, a new metro would also address traffic concerns and offer a dependable alternative that would also be environmentally sustainable. The Orestad Development Corporation was formed in 1993 to oversee development of the new Metro with 55% ownership by Copenhagen’s municipal authority and the remaining 45% in the hands of the Danish government. They appointed COWI, a large Danish Engineering and Planning Consultancy, to be overall Project Manager and specialist consultants for civil works design. Other specialist consultants were selected for rolling stock, railway systems, traffic, environment and architecture/town planning. Metro development by 2009 includes 34 trains and 22 metro stations (9 underground & 13 at ground or bove ground level] over a distance of 13 miles throughout the city of Copenhagen. Stations are concentrated downtown and in residential areas with the addition of the station at Copenhagen Airport. Most passengers begin their trip as pedestrians or cyclists. All stations offer ample bike parking and the standard station design includes an elevator, stairs and escalators. All stations and trains are designed for all, and generous space is allocated for passengers using wheelchairs, bikes or with baby carriages. Everyone benefits from the level gap of 2.2 inches between train and platform. Seats inside the train are supported directly off the walls, making maintenance and cleaning easier. Each car includes ample storage. In consideration of the needs of visually impaired passengers, strong color contrasts, primarily a bold yellow, clearly identify railings. Seats are colored to offer a sharp contrast with the walls fo the cars. Bold color contrasts are also seen at the intercom system with its red and green controls on a yellow surface. The intercom system is used by a great variety of passengers of all ages with or without disabilities. The Metro has since its birth been considered comfortable, dependable, safe and easy to use for most passengers. With a waiting time less than three minutes and with a maximum speed of 50 miles/hour the Metro has become very popular among a wide diversity of users. The platform in Frederiksberg Station. Color photograph of three sets of escalators in a Metro station from above with people visible on all escalators and on the wide walkway on the bottom level. Daytime contextual image of the Kongens Nytorv station from above. Inside the Islands Brygge Metro station. A woman is standing by the Standing chairs talking in a cell phone. Tactile floor markings in station. The Danish architectural company, KHR Arkitekter A/S has together with Carl Bro Design designed most of the metro stations in collaboration with Giugiaro Design who has designed the metro trains. Some of the main materials used in the construction are steel, glass and granite. The stations’ minimalistic and functionalistic Scandinavian design is timeless and distinct which is shown by the straight lines, the sleek surfaces, and the light gray colours. The elegant Italian design expertise complements the unrivalled Danish expertise in functional design. Constant attention was focused on the needs of the passengers during the development of Copenhagen’s new Metro train, whose design and development were based on user tests. The point to be emphasized was that people who get around on their own in everyday life should also be able to do so in the underground system: train, platforms and stations. "If at all possible, disabled people should be able to use the Metro without assistance," says Morten Søndergaard, one of the Project Managers in Oerestadsselskabet (the Oerestad Development Corporation. Ed. ), the billion Danish Kroner project which will ensure that Copenhagen’s citizens will be transported quickly and safely through their capital from 2002. "No extra cost is involved in thinking – and in "thinking in" – Design for All, as long as it is done from the start. Consequently, foreign suppliers were involved at an early stage, to make sure that technical requirements as well as user demands were integrated into the design work from the start," says Morten Søndergaard. He further describes the close co-operation between designers, technicians, architects and, not least, the users as "an optimum between design and technique". The foreign suppliers are Italian train manufacturers Ansaldo Trasporti, who manufactured the Copenhagen underground train in close co-operation with the design firm Giugiaro Design, while Denmark’s Carl Bro De-sign laid down the outline framework before the Italian partners went to work. Prior to putting out the call for tenders for the contract, the Oerestad Development Corporation entered into a dialogue with some of the Danish disabled people’s organizations. Meanwhile, Carl Bro Design undertook various types of passenger test. Train design is nothing new to Carl Bro Design, as the studio already designed the Danish IC3 train and Copenhagen’s new S-train. "We wanted to clarify elements such as door widths, size of seats, seat sections, principles of arrangement and the positioning of knobs and handles before the contract was put up for tender," comments Morten Søndergaard. Passengers with prams, bicycles and luggage, and children, visually impaired persons, wheelchair users, walking-impaired persons and others with impaired hearing all took part in the tests, whose results combined with the technical specifications enabled simple sketches and descriptions of the layout to be drawn up for inclusion in the contract documents. In addition, the Metro Company compiles user satisfaction surveys every quarter. The goal is to obtain at least 80 percent happy customers and one of the latest satisfaction inspections showed that 98 percent of the users were either “happy” or “very happy” with the Metro. The satisfaction with the Metro is clarified by the increase in number of passengers mounting from 3.3 million passengers in 2002 to 40 million trips in 2007. The design meets the very important aim of creating safety in the trains and stations and protecting passengers both from accidents and from dangerous people. Whether you use the stairs, the escalators or take the glass elevator down to one of the underground stations, you will have a good overview of the station and the people who are waiting for the train. 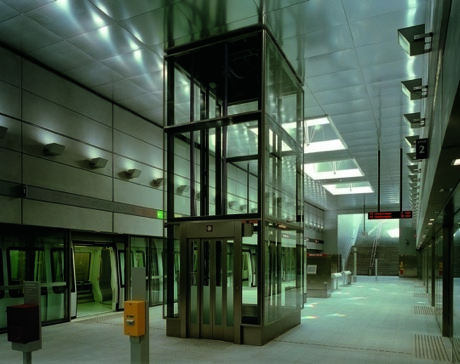 The surface lighting from prisms above the stations and aluminium covered surfaces, which reflect the natural daylight all the way down to the underground stations, enhance a sense of safety and control. All stations have video surveillance, and most trains have Metro stewards on board. The platform conditions have also been designed for safety. Automatic glass panel doors separate the train and rails from the platform. They create safety for visually impaired passengers and prevent people from falling or jumping down to the rails. The glass panel doors also improve the indoor climate. The Metro Company is very conscious about environmental issues and the role of the Metro in the quality of life in Copenhagen. Through the web site www.m.dk plus the magazine “Metro News,” they continuously encourage passengers to contribute ideas for improving environmental sustainability. The best ideas enter into the Metro Company’s environmental strategies. The magazine also serves as a forum for comments and questions on any topic from users of the Metro as well s providing information regarding the Metro and events in Copenhagen. Although most passengers are satisfied with the Metro and the various special features, people do express some dissatisfaction. The waiting time at the intercom system for a steward to reply a passenger request has been a problem to many passengers. The elevators at the stations are often out of use due to vandalism and wear and tear. Some passengers find the seats too small, and some passengers demand more poles to grab onto when standing in the middle of the train. Likewise, when travelling to the Copenhagen Airport, foreign passengers have had trouble getting off at the correct station due to a confusing speaker call. Also, many of the passengers that use the elevators everyday complain that there is only one elevator at each station. Level free access to the trains (55 mm. gap between the train and the platform). Audio information on platforms and in the trains. Tactile marking/guide strips on forecourt and stations together with Call Points. Visual marking of stairs and platform front edge. Wire loops in Call Points. Platform doors in underground stations. Seating is supplemented with “perching” chairs that do not take up space in the stations. Special whisper speakers for blind and visually impaired people to compensate for written boards. High contrast detailing in the cars. Ample floor space in cars for bikes, strollers and wheelchairs. To save energy the tunnels have been built on slopes which make the trains save energy by accelerating downhill. The brake energy from trains braking is converted into electric power that is used by the other trains. High level of light. Through top-lighting the stations, daylight is used to create a bright, secure, and comfortable environment. At the same time it reduces the amount of electricity and artificial lighting needed. The artificial lightning used comes from low energy lamps. Papers that are left in the trains are collected and recycled continuously. Weed on the tracks is collected mechanically to avoid pesticides. When washing the trains, only environmentally correct cleansing agents are used. The water used for washing the trains is reused in order to reduce consumption.